Can’t come to one of our open days at the Tio campuses? No problem! We offer you the possibility of attending an online open day from your lazy chair. Just sit back & relax and we will tell you all about Tio and its possibilities for you! You can find the recorded online open days at https://www.tio.nl/en/open-days/. During the 1-hour English webinar, which you can follow via a live stream, we will tell you all about studying at Tio University of Applied Sciences. About our Hotel and Event Management, International Business Management or International Tourism Management course. After the informative part there is time for a live Q&A. The online open days for Tio University of Applied Sciences are for all (international) students and students who are looking for top education programmes that offer small-scale, personal education. Tio offers higher education in the areas of hotel management, event management, marketing, tourism and business. To attend a webinar, sign up for free. After your registration you can attend the open day on the day mentioned from your lazy chair. Sit back and relax. Visiting an open day has never been easier! Tio University of Applied Sciences stands for personal, excellent and entrepreneurial education and has had an excellent reputation as a renowned educational institute for years now. All of Tio’s higher education programmes have been voted one of the best in their field by the higher education selection guides. 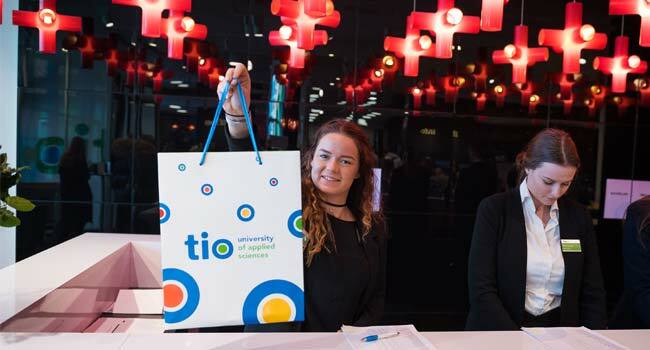 Tio University of Applied Sciences offers English courses in hotel management, event management, marketing, tourism and business at Amsterdam and Utrecht. All the teachers at Tio University of Applied Sciences are professionals in the field who are able to pass on a great deal of practical experience to their students. Three more things that distinguish Tio are the small scale, the personal atmosphere at the locations and the possibility of accelerated study. Want to know more about Tio, Tio’s open days or the possibilities for you? Please contact us here and we will be happy to help you.